Find all the accessories you need for 3D printing: tongs, spatulas, adhesives, adhesive tapes and adhesive coatings. These tools quickly become useful after a few 3D prints have been produced. Be sure to read the recommendations to choose your best equipment. The accessories are part of an essential kit for 3D printing, low prices, great results. Please ask our technicians to help you make your selection. Essential accessories for good printing are: cutting pliers, adhesive lacquer, needles for unclogging the nozzle. These tools will be useful with all FDM 3D printers (deposit of melted filament). Also select glue if your pieces are large and you want to assemble them. The epoxy adhesives for assembling the printed pieces are available in several forms, glue tube or pipette and syringe. These adhesives for PLA, ABS plastic and other plastic filaments can be used in all conditions. Makershop3D has selected the best tools for 3D printing. The tools are part of the kit required for good 3D printing, at low prices, find all the deals and special offers on the ideal tools for removing the pieces from the printing plate or cutting filaments cleanly. To avoid any warping or peeling of your 3D prints on your printing plate, Makershop3D offers a range of tapes or sprays aimed at preventing any printing problems related to the deformation of 3D printed pieces. To prevent any compatibility issues with your 3D printer and European sockets, we sell you a USA/Europe adapter, but also an 8GB SD card to quickly and easily transfer your files to your 3D printer. For maintaining your printer, we offer a range of products specially designed for this purpose such as a plate cleaner, a dust-removal aerosol or lubricant. 3D modelling software packages play a big part in the success of your printing, so we offer modelling software tailored to your needs and your skill level. We offer simplify 3D, but also 3D printer OS with a premium or education licence. The pack includes everything you need to start 3D printing. All the tools brought together in a 'starter pack' to help with your first prints and look after your 3D printer. Ideal for post-treatment of 3D printed objects, the XTC 3D kit smooths your 3D prints to give them a smooth appearance. This smoothing kit works on many materials: ABS, PLA, resin. It’s simple to use, transparent, and the effects of the product are fast. Read the instructions before use. Bi-material cutting pliers for your 3D printing-related work. These pliers let you cut your filaments cleanly to print freely. Bi-material pliers for your 3D printing work. These multi-function pliers also cut, so you can cut your filaments cleanly for hassle-free printing. The 3M BlueTape 2090 ribbon is put on the printing plate to prevent problems of detachment (or warping/curling) encountered when printing. It sticks perfectly, is easy to position and take off without leaving marks on your printer’s print plate. D-Limonene is used for dissolving HIPS-type filaments. HIPS filaments, used mainly as print supports, dissolve in a few hours in D-Limonene. Use with care. Kapton tape helps your 3D prints stick better to your plate, regulating temperature changes of the print surface to avoid peeling. 33m long x 40mm wide. 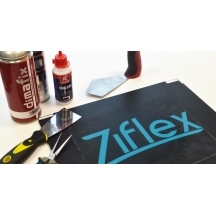 Adhesive specially designed to glue and assemble objects printed in nylon. The Taulman materials manufacturer offers this special glue to join objects easily with a special adhesive. (Keep out of reach of children). The buildTak support system is perfect to reduce warping while printing complex materials like ABS or PC. BuildTak is available in different sizes. Buildtak special 3D printing spatula, ergonomic function with non-slip plastic handle to easily remove prints from the 3D printer plate. Heating plate cleaner, designed for 3D printers. This cleaner ensures a smooth surface and removes impurities after printing. 500ml spray. PLASTIMPERM F10 is an aqueous formulation for thermoplastics and all parts printed using 3D printing technologies. This product is specially formulated to provide impermeability to materials from water, oil and certain solvents and chemicals.